Shock Top Ruby Fresh Grapefruit? Yeah, what the hell!?!?! After twisting off the cap, I poured this into my "Bud Drinking Glass." So this is a Belgian-style wheat ale brewed with citrus peels and coriander and other natural grapefruit and orange flavors. 5.2% alcohol. Citrus rind, grapefruit aroma on top of a wheaty base. Tangy orange flavors come first, plenty of citrus rind. Coriander is noticeable. 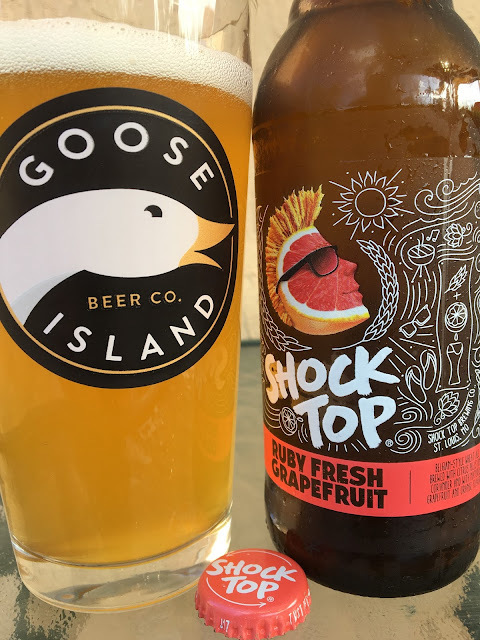 Not really sure about any grapefruit, shock topping considering the name of the beer! The texture is kind of dirty, thick, grainy. And an underlying unpleasant flavor persists. PASS!!! !